Syracuse guard Buddy Boeheim watches game action with father Jim Boeheim looking on from the sidelines. Mandatory Photo Credit: Initra Marilyn, The Juice Online. Item: As anticipated, there would be no last-second wondering this year, the Syracuse players, coaches and staff saw the ‘Cuse name appear on the NCAA Bracket during Sunday night’s “Selection Sunday” telecast while encamped at the ‘Melo Center. With three ACC teams landing No. 1 seeds, it figured the Orange would be sent out to the West Regional which they were as the No. 8 seed to meet No. 9 Baylor on Thursday night (9:57 p.m. ET approximately / truTV) in Salt Lake City. Advance and the region’s top seed Gonzaga awaits. 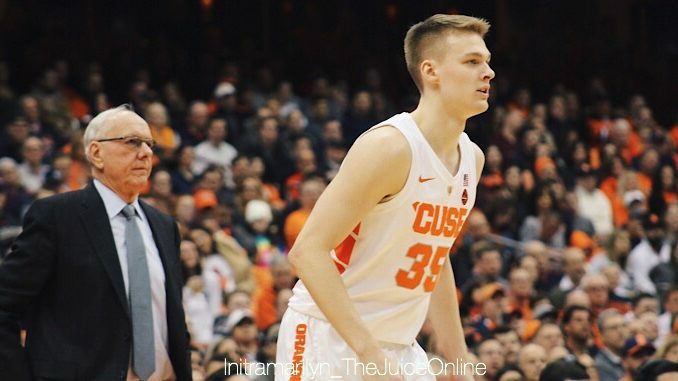 Jim Boeheim has been involved in all but one of Syracuse’s now 40 NCAA Tournament appearances. That was the 1957 tournament, SU’s first, and it’s first-ever NCAA game was played against Connecticut at Madison Square Garden. The Orangemen fell in the East Region final to North Carolina 67-58 at The Palestra in Philadelphia. Since then, Boeheim has been involved in the rest of Syracuse’s myriad of NCAA journeys that have included games played in an amazing 50 U.S. cities, covering the top 13 media markets, from New York, L.A. and Chicago, down to Denton, Tex. and Ogden, Utah (Seattle-Tacoma is the largest metro area SU has yet to play an NCAA game). First as a player Boeheim helped SU to the East Region final in 1966 losing to Duke 91-81 at Raleigh, N.C., then to 38 tournaments as head coach, winning it all in 2003, but not winning two consecutive games in a tournament until his 12th season on the bench, 1987, and that year narrowly missed his first title. Now 14 years after being enshrined into the Hall of Fame, Boeheim will coach his son Buddy in his 89th NCAA game Thursday in Salt Lake City against the Big 12’s Baylor (19-13). The Bears finished with a similar overall and conference record as the ‘Cuse, but have dropped seven of their last 11 games and were blitzed by Iowa State 88-63 in the Big 12 quarterfinals. The last time Syracuse played an NCAA Game in Utah’s capital city was not a pleasant memory. The 2010 Syracuse team was primed to make a title run until Arinze Onuaku hurt his knee in the Big East Tournament, yet was still the No. 1 seed in the West Regional. SU beat Vermont and, ironically, Gonzaga, in Buffalo, before falling to underdog Butler in Salt Lake City in the Sweet 16 at what is now known as Vivint Smart Home Arena. A win over Baylor in the usually competitive “8/9 game” (Syracuse lost the only other time it played in this game, 69-61 to Oklahoma State as the No. 8 seed in the Midwest Regional in 1999 at Indianapolis) has to occur before the ‘Cuse can even think of an opportunity to win its third NCAA game (2010, 2016) against the big, bad 30-3 Zags. The first round matchup against a team that will hoist its fair share of 3s, will go a long way towards showcasing how much was “gained” from falling to Duke (twice), Virginia and North Carolina late in the season, with the zone aiming to baffle the Bears outside shooting and finding just enough offensive production from the top eight players to survive.